Ramadan is a lunar month, which is coming in a few weeks as I am writing this article. During this month Muslims fast by avoiding any kind of eating or drinking as well as medications or smoking for certain hours every day. Fasting has many effects on the body and its physiology, which requires good understanding of these changes and the effect they have on diabetic patients. According to the EPIDIAR(Epidemiology of Diabetes and Ramadan) study on 12,243 Muslims from 13 different countries, approximately 43% of Type 1 Diabetes patients and 79% of Type 2 Diabetes patients fast every year during Ramadan. In this article we will go through the changes in the body and pathophysiology of the body during Ramadan, as well as the changes and guidelines that should be taken into consideration by diabetic patients during the month of Ramadan. In healthy individuals, feeding promotes the secretion of insulin (a hormone secreted from the pancreas), which is responsible for the storage of glucose sugar in muscles and liver as glycogen. Levels of Insulin tend to decrease during fasting as a result of the decreased glucose levels. On the other hand, levels of catecholamines and glucagon are increased, which stimulates glycogen degradation. After several hours of fasting, the stores of glycogen are depleted, and increased levels of fatty acid are released from fat cells as a result of the low circulating levels of insulin. Fasting due to religious reasons rarely exceeds 24 hours meaning that the body rarely reaches the second and third phases. Hypoglycemia: Because of the decreased food intake during fasting, the blood sugar levels may decrease below normal levels causing a serious condition called hypoglycemia. Hyperglycemia: In people with severe insulin deficiency, there is a risk that with prolonged fasting there will be excessive breakdown of glycogen stored in the body leading to production of large amount of glucose (hyperglycemia) and ketones (ketoacidosis). Such hyperglycemia and ketoacidosis are more common in Type 1 diabetics, although type 2 diabetics can also get hyperglycemia (but not ketoacidosis) if they are severely insulin deficient. According to the EPIDIAR study, patients suffering from Type 1 Diabetes have a three-fold increased risk of developing hyperglycemia when fasting; while patients with Type 2 Diabetes have a five-fold increase in the risk.Several studies including the UK Prospective Diabetes Study and the Diabetes Control and Complications Trial (DCCT) have showed that there is a link between increased levels of blood glucose sugar (hyperglycemia) and the development of complications arising from damage to both large and small blood vessels. Diabetic ketoacidosis: As mentioned in the previous risk, there is an increased risk for the type 1 diabetics to develop ketoacidosis – a dangerous (and sometimes fatal) condition where there is an accumulation of ketone bodies in the blood which acidify the blood. This could be both because of reduced insulin intake during fasting, increased blood glucose due to excessive breakdown of glycogen and increased breakdown of fats also due to fasting. Dehydration and thrombosis: During fasting, there is a decrease in fluid intake, which if prolonged may lead to dehydration. This is compounded in hot and humid climates and in people who do hard physical labor. In case there is increased blood sugar due to fasting, it will cause increased urination and lead to further dehydration. Dehydration can cause low blood pressure in patients with diabetic nerve damage – this is the cause for fainting, falling, injuries and fractures, and changes in the composition of blood contents along with increased viscosity of blood resulting in thrombosis (increased coagulation of blood inside the blood vessels). Individualization: When managing diabetes, it is important to look into each case alone and not to generalize guidelines for all patients. Each case differs from the others. Frequent monitoring of glucose levels: It is very important to monitor blood sugar levels several times during the day when fasting, especially for patients who depend on insulin. Nutrition: Inappropriate diet or food intake is responsible for many health problems, and there is a major change in dietary habits during fasting in Ramadan. Many studies revealed that approximately 20% to 25% of people either lost or gained weight during the month of Ramadan. Diabetic patients are advised to avoid taking large amounts of food that is rich in carbohydrates and fats during the main meal at sunset after a long day of fasting. Eating complex carbs is recommended in the predawn meal and a meal containing simple carbs as sunset meal. It is also advisable to eat as close to starting the fast as possible and to drink more fluids during the non-fasting period of the day. It is also important to maintain a healthy and well-balanced diet at all times including the Ramadan Diet. Exercise: Physical activity is good for diabetic patients and normal levels of it may be maintained during the month of Ramadan. However, it is recommended to avoid excessive exercise especially during the last hours of fasting (before sunset) as there is an increased risk of developing hypoglycemia, which is a serious complication. Type 1 diabetics must note that if their diabetes is not well-controlled, exercise may lead to extreme hyperglycemia (high blood sugar). Breaking the fast: Fasting during Ramadan has religious reasons. However, diabetic patients should understand that in some situations they must end their fast in order to avoid serious complications. If blood glucose levels drop less than 60 mg/dl or go above 300 mg/dl, then fasting should be broken. It is important for all diabetic patients to undergo a full assessment 1 to 2 months before Ramadan. It is also important to make sure that blood pressure, lipids, and blood sugar are all well-controlled. Even patients who wish not to fast are required to undergo this assessment, because they still have the risk of getting some complications because of the eating and other habits during the month of Ramadan. The assessment should also include education of the advantages and the disadvantages including the risks that may develop because of fasting. The main problem with the education is combining the religious beliefs of Muslims who want to fast and the risks of fasting in diabetics. However, if the above components were applied in the community, it will result and a very good structured education system, which can teach diabetic patients how to control their diabetes even after Ramadan. Many patients suffering from Type 1 Diabetes wish to fast during the month of Ramadan. Patients suffering from Type 1 Diabetes are insulin-dependent. In order for them to fast, they have to monitor their sugar level carefully during the whole day. And it might be needed to adjust the doses of insulin depending on their particular case, which is why it is very important to undergo the pre-Ramadan assessment. According to the DCCT and EDIC (Epidemiology for Diabetes Interventions and Complications) studies, intensive management of blood sugar helps protect against complications arising from damage to the small and large blood vessels and the effects last a long time. Patients with diet-controlled diabetes: The risk of developing any complications is very low in patients who control their blood glucose by lifestyle and diet changes alone. However, the risk of developing hyperglycemia is still present especially after the big meal at sunset, which is why it is advised to divide it into three meals during the non-fasting hours of the day. It may also be important to adjust the exercise levels and timings during fasting to avoid low blood sugar levels. Diabetic patients managed with oral drugs: The drug of choice is different from one patient to another. Generally, drugs that act by increasing the secretion of insulin are associated withhigher risk of developing hypoglycemia than drugs that act by increasing the sensitivity of insulin. Metformin: The risk of developing hypoglycemia is very low in patients who use Metformin, which makes it safe for them to fast during the month of Ramadan. However, the dosage should be adjusted during this month to match the eating habits. Thiazolidinedione: These drugs do not have direct effect on hypoglycemia; however, they may still have the hypoglycemic effect like other drugs. The main concern about these drugs is the cardiovascular risks associated with it. Sulfonylureas: Like all the other drugs, the use of this group of drugs is individualized and differs from one patient to another. Generally, it is advised to avoid this group of drugs during fasting because they are associated with higher risk of developing hypoglycemia although the newer sulfonylureas like glimepiride or gliclazide MR fare better and have a lower risk of hypoglycemia. According to the ADVANCE (Action in Diabetes and Vascular Disease) and UKPDS (UK Prospective Diabetes Study) studies, this group of drugs benefits the heart and blood vessels . There are other oral drugs that may be used for management of Type 2 Diabetes depending on the patient. Also, it is important that a health care professional makes an assessment to discuss any adjustments. Diabetic patients treated with insulin: Patients who suffer from Type 2 Diabetes and depend on insulin for management have problems similar to patients suffering from Type 1 Diabetes. Because they depend on insulin, they have higher risk of developing hypoglycemia. It is important to monitor sugar level regularly and adjust the insulin doses according to the meals. From a religious point of view, pregnant Muslim women are exempt from fasting during the month of Ramadan; however, some women insist on fasting during this month. During pregnancy, many physiological changes happen to the body including increased insulin resistance and secretion, which requires serious evaluation before the beginning of the month of Ramadan, and continuous monitoring during the fasting days. This is because insulin resistance leads to high blood glucose and high A1C levels are related to congenital malformations (abnormalities/defects that appear in an infant right from birth). Pregnant women therefore should be strongly advised against fasting during Ramadan. Education (not only of the patient, but also of the family, community and religious authority) is very important as well, in order to make sure that they are aware of the risks and complications, and how they may avoid these complications if they insist on fasting. Fasting affects the physiology of the body and it is important to manage blood pressure and lipids (cholesterol and/or triglycerides) correctly during the month of Ramadan. Assessment of patients before the month of Ramadan is very important in order to make the right adjustments either regarding the type or the dosage of the anti-hypertensive drugs used. Many risks and complications may develop in diabetic patients because of fasting. Patients suffering from Type 1 Diabetes have higher risk of developing serious complications like severe hypoglycemia, hyperglycemia and ketoacidosis due to their depence on insulin for treatment and are therefore strongly advised not to fast. Patients suffering from Type 2 Diabetes have lower risk of developing hypoglycemia or other serious complications. However, hypoglycemia may still happen in these patients especially if they depend on insulin for management. The use of an insulin pump may have better effects on controlling the sugar level. These are questions I have received from readers around the world. Fasting during Ramadan is a religious act, and Muslims do their best to perform this act. However, if fasting has some serious complications or health effects on the body (like in the case of diabetes) then it might be a better choice to avoid it. What risks should I be aware of if I am fasting? Many risks and complications are associated with fasting if you are diabetic including hypoglycemia (meaning a very low drop in the blood sugar level), hyperglycemia and ketoacidosis. You can find more information in this article itself. It is very important to go through assessment before the beginning of the month of Ramadan. Is it okay to check my blood glucose during day-time? Can it break my fast? Checking your blood sugar level does not break your fast, and it is fine to do that during the hours of fasting. Actually, it is strongly advised to monitor the sugar level regularly during the fasting and non-fasting hours of the day. Should I stop taking my medication during Ramadan? The type and the dosage of the medications are different from one patient to another. You will not stop taking your medications during Ramadan; however, you have to go through an assessment before the beginning of the month in order to get the right adjustments to the type and the dosage. It is advised to divide your meals into three small meals instead of having a very large meal at sunset and another one at predawn. The type of the food you can eat will not be different when compared to non-Ramadan days; however, you should keep monitoring your sugar levels regularly to avoid hyper- or hypo-glycemia. What happens to your body during fasting has been explained in the Pathophysiology of fasting section above. Please go back to that section to get a deeper understanding. I have diabetes, can I fast? Fasting carries a lot of complications if you suffer from diabetes; however, that does not mean that you cannot fast. You can still fast, but you have to go through assessment in order to make the right adjustments and changes you need. Is it okay to fast if I am pregnant? From a religious point of view, Muslim pregnant women are exempt from fasting. Because of the risks associated for the unborn child, you are strongly advised not to fast. However, if you still decide to fast you should make sure that you have the right education and assessment is before the start of Ramadan in order to evaluate the related complications and to be more safe. Do I have to wake up for Suhoor (Sehri)? Yes, it is strongly recommended to have the Suhoor meal; however, you should get assessed by your doctor in order to adjust your medications according to your eating habits in Ramadan. You should also be especially careful of longer fasting times if you live in a country where Ramadan is in summer time and the summers have longer hours between sunrise and sunset (of up to 18 hours). You must wake up for Suhoor just before sunrise so that your blood sugar remains more balanced throughout the fast. What types of food and drinks should I eat? The types of food that you should eat during Ramadan do not differ from the types you can eat in normal days. You should make sure that you have a well-balanced and nutritious meal at all times. Make sure you have plenty of water at Suhoor and after Iftar to avoid dehydration and related complications. Can I pray Taraweeh? Can I walk to Taraweeh? The prayer of Taraweeh can bea strenuous activity and can lead to dehydration and hypoglycemia.As a diabetic you can perform Taraweeh after making sure that you have had your evening meal. However, this should be considered a part of your daily exercise program and you should not exercise too much additionally. Walking to Taraweeh may be alright if you do not have to walk excessively long distance and do not have any problems with your feet. Also be careful if you take insulin for managing your diabetes – you may need to reduce the dose or eat before you walk to Taraweeh. What types of food should I eat at Eid-ul-Fitr? This is also similar to the types of food you can eat during the month of Ramadan. You eat as you would normally eat in any day making sure that you do not make big changes in your eating habits. Ibrahim Salti, Eric Bénard, Bruno Detournay, et al. A Population-Based Study of Diabetes and Its Characteristics During the Fasting Month of Ramadan in 13 Countries. Diabetes care10 (2004): 2306-2311 http://care.diabetesjournals.org/content/27/10/2306.full. Accessed May 16, 2016. Monira Al-Arouj, Samir Assaad-Khalil, John Buse, et al. Recommendations for Management of Diabetes During Ramadan. American Diabetes Association. Diabetes Care 28.9 (2005): 2305-2311. http://care.diabetesjournals.org/content/28/9/2305.full. Accessed May 14, 2016. Ramadan and Diabetes. Joslin Diabetes Center. http://www.joslin.org/info/Ramadan-and-Diabetes.html. Accessed May 14, 2016. 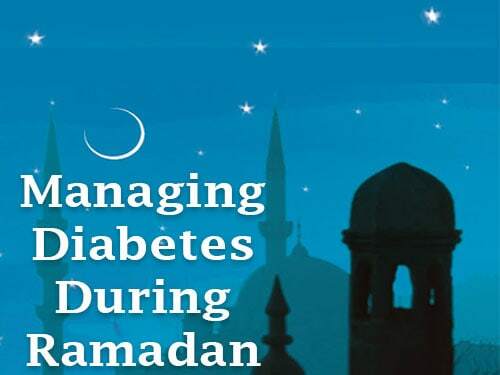 Managing Diabetes During Ramadan. Diabetes UK. https://www.diabetes.org.uk/ramadan. Accessed May 14, 2016.